Includes ticket price and service fees, but does not include delivery charges. For this show you’ll need to display your ticket on your phone via The SSE Arena, Wembley app. Our official ticketing partner AXS will send you an email closer to the show when your ticket is ready. You can find out everything you need to know about Flash Mobile Delivery here. 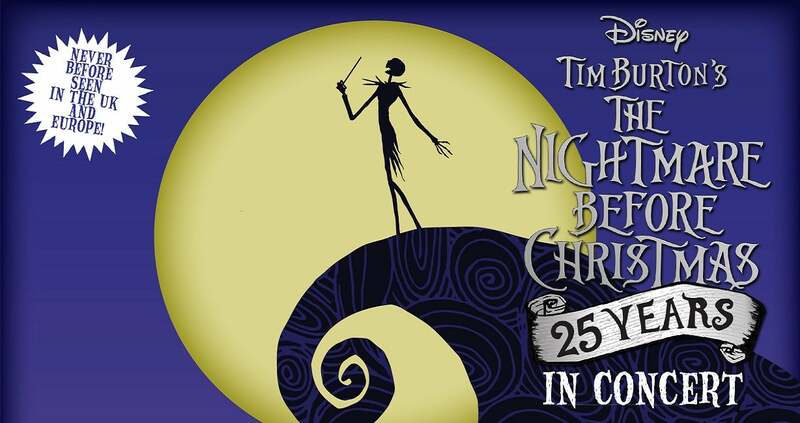 Multiple award-winning composer, songwriter and reigning Pumpkin King, Danny Elfman will be bringing Disney’s timeless classic, Tim Burton’s “The Nightmare Before Christmas" to life for two very special UK arena shows in December 2019 as part of the movie’s 25th anniversary celebrations. Elfman, performing his role of Jack Skellington, will be joined by other original cast members Catherine O'Hara as Sally, and Ken Page as the voice of Oogie Boogie with full orchestral accompaniment by The London Philharmonic Orchestra at The SSE Arena, Wembley. Conductor John Mauceri, Founding Director of the Hollywood Bowl Orchestra, will be leading the full orchestra and choir performing the film's classic score and songs live to picture. The concert will also include featured violin soloist, Sandy Cameron. Danny Elfman, who wrote the film’s songs (music and lyrics), composed its original score says, “Being able to perform “Nightmare” live in synch to the movie with a full orchestra was such a thrill at the sold out Hollywood Bowl shows. Having Catherine O’Hara and Ken Page to perform with me really made it a unique and magical experience. I’m happy to bring this special night to the UK for the first time in December." First released in 1993, Tim Burton's “The Nightmare Before Christmas” was directed by Henry Selick (“James and the Giant Peach”) and based on a story and characters by Tim Burton. The film follows the earnest-but-misguided adventures of Jack Skellington, Halloween Town's beloved Pumpkin King, as he attempts to take over the Christmas holiday. Against the advice of Sally, a lonely rag doll who has feelings for him, Jack enlists three mischievous trick-or-treaters - Lock, Shock, and Barrel - to help him kidnap Santa Claus. Tim Burton’s fantastical tale was a box office smash which received rapturous reviews across the board has become a staple part of the extended holiday season. The Nightmare Before Christmas Live in Concert, December 2019 follows 3 sold out nights at the prestigious Hollywood Bowl earlier this year and will be the second time this special concert event has left the USA. © 2019	The SSE Arena, Wembley.